Transport Minister Paul Maynard MP witnessed the introduction of the first Citylink Tram Train into passenger service on the Supertram network in Sheffield. The innovative vehicles will eventually run as tram trains between Sheffield city centre and Parkgate via Meadowhall South and Rotherham town centre in 2018. For now, they are being used on the existing Supertram network in Sheffield. With funding from the Government, the £100m scheme is set to run for two years with a view to permanent operation. It is the first of its kind in the UK and if it is successful, it opens the way for tram trains to be introduced in other parts of the country. Transport Minister Paul Maynard (pictured, second right) said: "South Yorkshire's Tram Train project is the first of its kind in the country and will transform services for passengers, enabling quick and easy movement across the region, reducing journey times and boosting the economy. Martin McKervey, board member of the Sheffield City Region Local Enterprise Partnership, said: "Launching this new tram is a crucial step in the tram train project, which is set to improve connectivity within Sheffield city region and make it easier for residents, visitors and business people to move around our urban centres quickly and easily. "I'm proud that we are the first region in the country to pioneer this innovative technology. Improving transport links is also a key priority in our new Inclusive Industrial Strategy, as we drive forward our aims in ensuring everyone across the city region is able to benefit from, and be a part of, our economic growth." Rotherham Council expects that the improved connectivity from next year will support the local economy and the new leisure and housing developments proposed for the town centre. Cllr. Denise Lelliott, Cabinet Member for Jobs and the Local Economy at Rotherham Council, said: "It is incredibly exciting to be travelling on this innovative tram vehicle on its inaugural journey across the Supertram network, ahead of the new tram train route to Rotherham being opened in 2018." South Yorkshire's new Citylink vehicles, which have been designed and produced by Stadler, will be used in the regular Supertram timetable from October to support the existing tram service across the network until the new tram train route from Sheffield to Rotherham is opened in 2018, once rail infrastructure work, testing and driver training is complete. 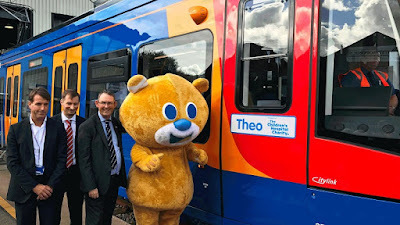 The first vehicle in service has been named Theo after the mascot of the Children's Hospital Charity.